Now that the Fallout series has finally gotten the 3D treatment it deserves, I no longer feel a sworn duty to sing the praises of the original Fallout games to those folks who weren’t playing PC role-playing games back in 1997. Heck, I wasn’t playing PC RPGs back in 1997, and I’m not really playing them now; I’ve never been fond of the listless errands-for-mannequins design mentality of most Western RPGs. The original Fallout is different--it even has a time limit, like Prince of Persia and Majora’s Mask do--and it works. Playing a classic game like Fallout is a great way to kill time between marathon writing sessions. It does not, however, work out of the box in a modern version of Windows. This isn't Fallout 3; the colors are all wrong, your only resolution option is a blurry 640 by 480 full screen, and the display often goes black seemingly at a whim. 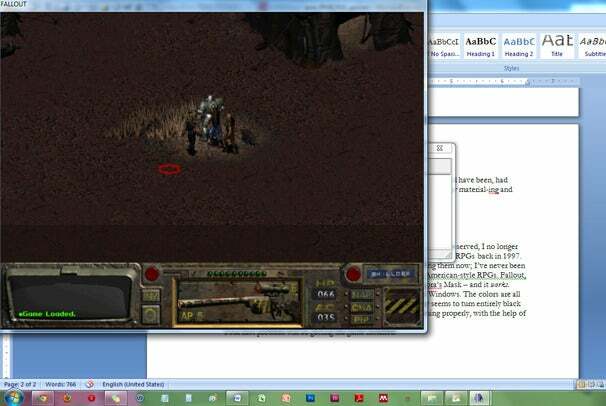 Luckily, getting the original Fallout and its sequel running properly isn't too tough if you use some external tools. The process is actually pretty simple, so let's get started. Next, copy the relevant files over from the CD. You’ll want to dump the entire \data directory, so you have \Fallout\data, and then put falloutw.exe, critter.dat, and master.dat in the main \Fallout directory (along with fallout.cfg). Use Mode= 4 for fullscreen, or 5 for windowed. These are the most modern and compatible (DirectX 9) display modes. GraphicsWidth= and GraphicsHeight= should reflect your chosen resolution. TextureFilter= 1 makes the game look much, much smoother at any resolution higher than 640 by 480. If you’re running the game at a resolution of 1280 by 960 or higher, you’ll be able to use some nice graphic filters by setting GlobalShaderMode=1 and setting ScaleFilter= to any value between 1 and 5 (see which one you like best). Finally, Thing Two: Download D3DWindower and extract it to your \Fallout directory. This program is designed to let you run older DirectX games in a window; unfortunately, it doesn’t always work 100 percent with Fallout, which is why we started with the sFall mod. However, you still need D3DWindower in order to add an Alt-Tab hook to the game, so that you can minimize or switch applications while playing. The interface is a little weird, so stay with me. Open D3DWindower, click the blue + sign, and point the program to falloutw.exe. Then, highlight the new falloutw entry in the D3DWindower interface, and click the second button from the right, which should open a settings window. Go to the Direct Input tab at the far right of this window, and tick every box. Click OK, and then close D3DWindower once and reopen it; the tool misbehaves if you try to run an application right after changing its settings. Once you've reopened D3DWindower, double-click on the falloutw entry. Bam--you’re all set! Good luck in the wastelands.